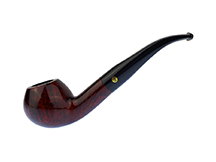 Milan Tobacconists offers a wide selection of fine pipes, such as the Brigham briar pipes shown below, for the discerning smoker at reasonable prices. If you are unable to easily locate a particular tobacco pipe, please give us a call at 877.70MILAN or send an email to customercare@milantobacco.com. We'll do our best to make a match! Roy Brigham began his journey in 1906 by opening a pipe repair shop in Toronto that met with great success, which afforded him the opportunity to make his own pipes. The family business grew quickly as Brigham's reputation for high quality workmanship and value spread. Roy and his son Herb did extensive research on the cause and "cure" of tongue bite and developed the patented Brigham Rock Maple Distillator, which improved the pipe smoking experience by reducing bite. 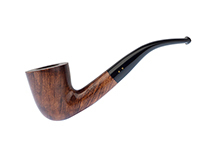 Economic conditions in the late 90's drove demand for even lower pipe prices and the first Brigham pipes made outside Canada began to appear on the market produced by esteemed pipe-making families in Europe trained in Brigham production techniques and methods. Today, Brigham is known for remarkably affordable pipes made with high quality briar and a unique smoking experience only Brigham can offer. Click on any link or image below to view all of the available pipe shapes in each of the Brigham lines.